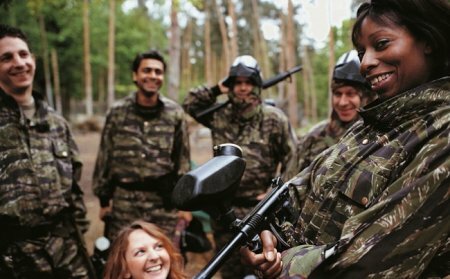 Sussex can offer a selection of Paintball sites to choose from, those being Brighton, Bognor Regis, Horsham, East grinstead, and Eastbourne. Many a Birthdays is celebrated with a paintball day out and its no wonder. With the Sussex Paintball sites being located in such convenient locations to continue the celebrations there are bars and restaurants a plenty. Semi automatic paintball guns are used at all of the Sussex paintball venues which are capable of shooting upto 7 balls per second! Only the best in equipment will be provided ensuring each and everyone of you gets a day out to remember. Clappers Lane, West Sussex, BN6 9EA. Cinderford Lane, Hailsham, East Sussex, BN27 4HL. Ladycross Farm, Dormansland, West Sussex, RH7 6PB. Old Hollow, Copthorne Road, Crawley, West Sussex, RH10 3PD. Holmbush Farm, Crawley Road, West Sussex, RH12 4SE. Raglington Farm, Botley Road, Southampton, Hampshire, SO32 2HL.